Comments from the desk of Dr. Tim Rasinski, Professor of Reading at Kent State University. Pam Schiller on how to use the principles of Bloom’s Taxonomy to improve reading comprehension. A Surprising Way to Reinforce Values, Standards and Leadership (and Build Comprehension): Reading Good Books at Home. 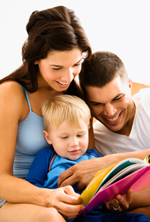 Cathy Puett Miller, TLA, Inc.
Building Receptive and Expressive Language Ability Oral language and written language skills interact with each other to build fluent, interactive reading. These activites can build children’s vocabulary, increase their communication skills and prepare them to adapt what they know about oral language as they explore written language. Puppets offer children wonderful opportunities to explore the meaning of concepts, story plots, and characters, facilitating future reading comprehension. As students “act out” a story, the depth of their understanding improves. Songs for Young Children and Curriculum Songs for Students of All Ages Music provides a most enjoyable way to build language facility. The latest references in the exciting field of teaching good reading comprehension.